Nowadays, if you took a trip down to Westminster and rudely heckled a Member of Parliament you probably wouldn’t get in too much trouble – not that we’d recommend it of course! But back in Fourteenth Century London you would need to be a little more careful before insulting a public figure or a church leader. If convicted of such an offence back then you’d be made to walk from The Guildhall to the end of Fleet Street carrying a heavy, lit candle. A little embarrassing you may think, but not all that bad? Well think again, as they made you do it barefoot! And according to Google maps that’s a nineteen-minute walk – over cobbles, animal dung, raw human sewage and broken pots. So not pleasant, but a walk in the park -or more accurately the excrement, in comparison to the punishment for ‘false trading’. 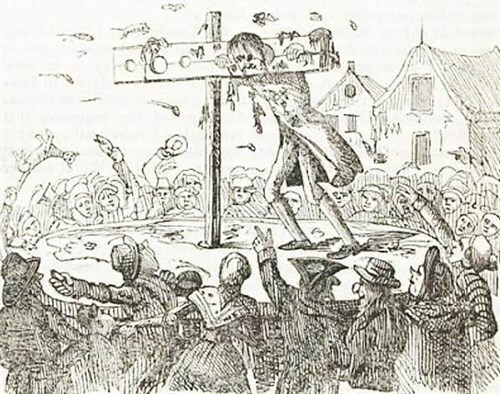 If you were a city trader, for example, and were found to be selling base metal as silver – in other words running a con – you would be sentenced to the pillory. Locked up in this wooden contraption for up to two hours, the public were encouraged to pelt you with rotten fruit, fish and er, well… even excrement. This was a punishment designed for maximum humiliation and reputation damage. For a particularly despised offender, however, the ordeal could become altogether more brutal when the crowd swapped food for stones and sticks. Thus, there were sometimes deaths in the pillory. No doubt there would have been an enthusiastic and large public turn out had the pillories at Cheapside and Cornhill still been open for business in 2007 to accept London’s modern false traders. But the Capital’s bankers were spared this pain and humiliation as the pillory was finally dismantled in 1837. So much for hecklers and dodgy dealers, what about the more serious stuff? Well, going back to the twelfth century the death penalty in London for the ordinary criminal was mainly enacted through hanging, and for nearly six hundred years it was done at the same notorious spot. Tyburn. 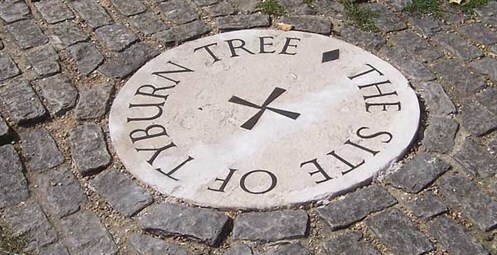 Once in the middle of a field on the edge of the city the site of the Tyburn gallows is now marked by a stone plaque in the pavement on the corner of Oxford Street and Park Lane. As a condemned man or woman, you’d be taken from Newgate prison by cart, accompanied by a cheering crowd. You’d get to stop at the church of St. Giles in the Field for a jug or two of ale, before carrying on down Oxford Street to the site of the gallows. Google tells us that’s a three mile journey from life to death. It’s impossible to know how many poor souls met their fate at the site over nearly 600 years but by the mid-1700s there were around 150 people a month being hung there. Execution on this scale required some mechanical ingenuity and one of London’s most famous hangmen invented a device that could hang 23 people at once. His contraption was found to be useful in unloading cargo from boats in the London docks and the crane that it finally inspired still hold his name today, the ‘Derrick’. There were many and varied crimes for which you could be hung in the past but from those early days in the late 1100s, and for a couple of centuries after, there was a way of escaping the noose. If you could read a passage from the bible you’d be handed over to the more lenient church authorities. This literary salvation became known as the ‘neck verse’. So, for a couple of hundred years in England, being able to read could actually save your life!